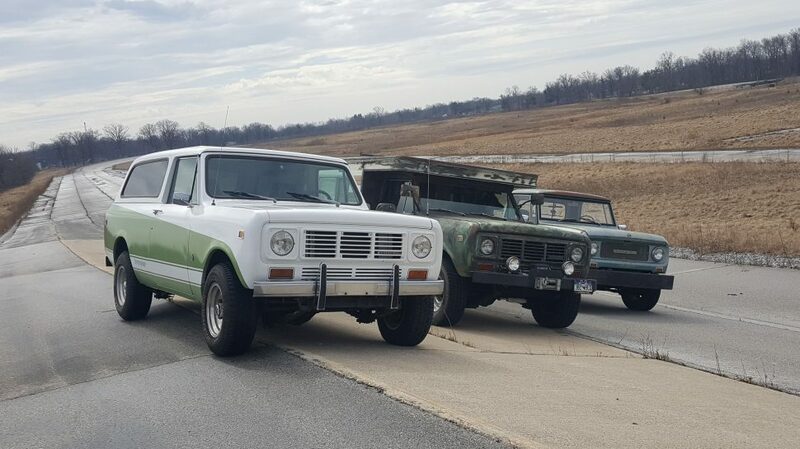 Left to right: A 1976 Traveler, a 1976 Scout II, and a 1968 Scout 800 at the International Harvester proving grounds. Photos courtesy Ryan DuVall. By the late 1990s, it had seemed to Ryan DuVall that the city of Fort Wayne, Indiana, had entirely forgotten International Harvester. Where other Indianapolis cities had built museums and organized annual car shows that celebrated the carmakers that once put those cities on the map, the citizens of Fort Wayne seemed content letting that chapter of its history — the chapter in which, according to DuVall, the city became “the heavy-duty truck capital of the world” — fade from their memories. Yet reminders of that time still dot the city. The old Scout factory along Coliseum Boulevard still stands and its clock tower still displays the International name. The residential neighborhood near the plant is still known as Harvester Community. The area around the plant is now known as Scout Industrial Park. And the old International test track across the railroad tracks from the factory — in use as late as 2014 — still has its chassis-twist section. What’s more, DuVall — who owned a Scout when he was a teenager — still saw an inordinate number of Scouts and International pickups on the city’s streets. Pretty much every farm surrounding the city still had some piece of International equipment. Though he didn’t ask that question directly, an article he penned in December for the Fort Wayne Journal-Gazette, where he works as a columnist and copy editor, started to stir 35-year-old memories. 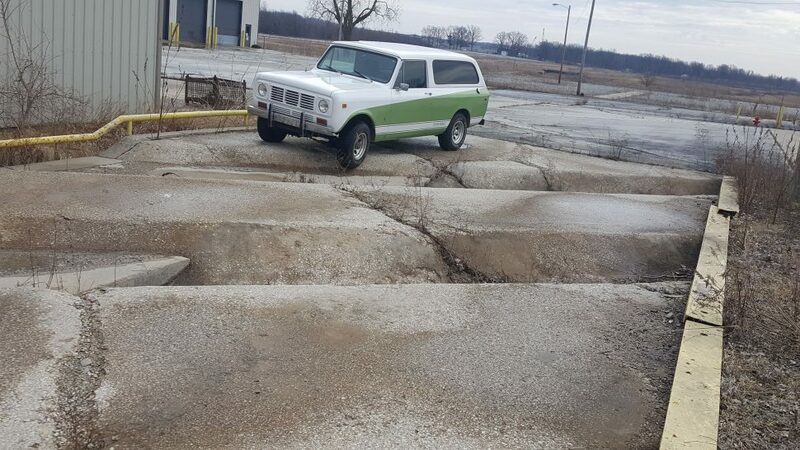 Ostensibly about the 1976 Scout Traveler that DuVall recently bought, the article pointed out the community’s failure to embrace its International Harvester legacy. “I have always been disappointed and kind of puzzled as to why the city hasn’t marked Harvester’s imprint better,” he wrote. Rather than let it pass unnoticed, community leaders responded, urging DuVall to take the lead on an event that would welcome International Harvester products back to Fort Wayne, an event that DuVall has called the Harvester Homecoming. DuVall’s Traveler on the chassis-twist section. In addition to a truck show affording many International Harvester enthusiasts and collectors a rare chance to display their vehicles in Fort Wayne, DuVall has also organized memorabilia displays from Fort Wayne residents’ collections and set up an opportunity for truck owners to take laps around the 1.18-mile test track. The show will also include an appearance by the Scout SSV prototype, currently in the Auburn Cord Duesenberg Museum’s collection, and he has been in touch with Navistar International to see if the company — now based in Chicago — would be willing to offer its support. While admission to the show will be free, DuVall has started to form a nonprofit that would fund future Harvester Homecomings as well as, ideally, a museum honoring Harvester heritage. He’s received plenty of help on that front from 3Rivers Federal Credit Union, which got its start as the Harvester Credit Union, providing service to International Harvester employees. “You never know what can happen when you start doing something like this,” he said. The Harvester Homecoming is scheduled for August 10. For more information, visit the Harvester Homecoming page on Facebook or VisitFortWayne.com.